First of all, im a danish soldier - deployed twice to Helmand. 1: The structure of the Danish army is basically the same as for example the U.S. Army. But our officers treat our soldiers in a little more human to human way, which means that anyone can make suggestions in a given situation so the best possible solution will be chosen on the ground - That is why he askes the way he does in relation to the "kill zone". 2: I know some of the boys involved in the documentary and in the days up to this operation, they have had many tough firefights and very long patrols, so they are all pretty devastated - That is why he askes the way he does , for precisely not to take people who may pose a danger to themselves or their unit. Secondly, they still need people to maintain the guard in the FOB. 3: They make an outflanking manoever, which sometimes requires that you run away from the enemy to get the best possible start for your reattack. @ Tomas,You heard them say kill zone yes, you must have its clear as day You go in draw fire see where its coming from, flank the fuckers and them crush them. As far as the commander asking if anyone was to nervous on this one and a couple stayed in why, me myself i have never been in combat, but have friends that did by talking to them you will know why they stay. They get that feeling that this mission is going to hell in hand basket and that they wont be coming back its just a soldiers feeling, that he is not right. Would you want someone who has the experience in combat but is just fubar on that day to be fighting and all of sudden shell shock hits under heavy enemy fire? No I don't think anyone would, I would rather have them stay back then be a hinder to the mission. It could do more harm then good by them going out on the mission, and getting his own people injured or worst. It does have some merit. 1) alleviates avoidable mistakes due to fatigue. 2) Allows the commander to asses morale. 3) Allows the commander to "cherry pick" his best without crushing the morale of the "rejects". It is perfectly normal for a commander to organize his standing and fighting patrols on a rotational basis, but it is also normal to cherry pick, and ask for volunteers. That was some very good soldiering. Particularly when you take in the fact that they knowingly walked into a kill zone, got ambushed, ran backward instead of forward, and still kept their wits about them to finish the job. Though I don't think the commander should be asking soldiers if they want to "keep out of this one". That can't be good for keeping a cohesive unit. But God bless all of them. Good job. U.S. Marines with 2nd Platoon, Weapons Company, 1st Battalion, 6th Marine Regiment inserting by helicopter across the Helmand River as part of Operation Western Storm in Kajaki Sofla, Afghanistan on Dec. 3, 2011. 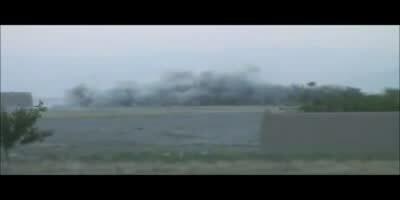 The operation was conducted to provide security for the Afghan civilians in the area.This video is from the Department of Defense and as such is in the public domain. Any copying, editing or reproduction is authorized and encouraged.